First we brown some chicken parts in a heavy enamel coated iron pot. We only had chicken parts on this occasion so we did legs, wings and thighs. 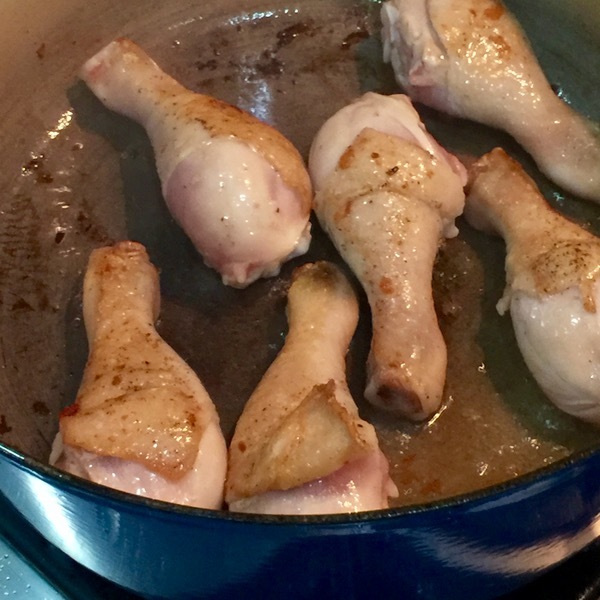 Otherwise, break down a whole small chicken and brown those parts in two batches. 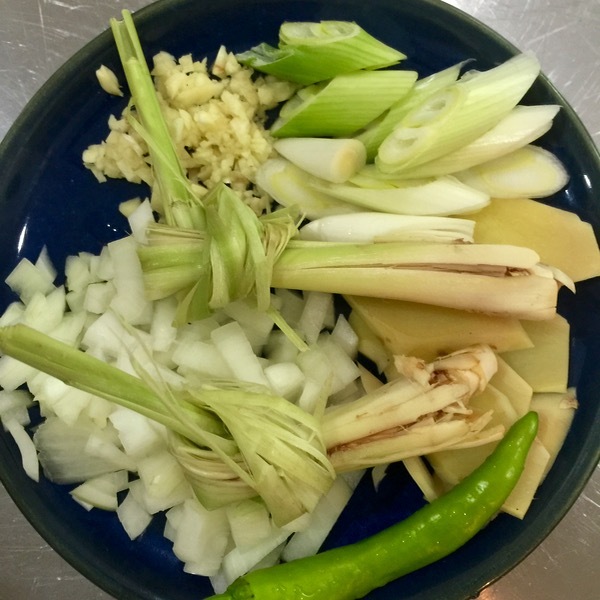 Remove the chicken parts, and saute some garlic, onions, lots of ginger, lemongrass, the white part of leeks until softened and aromatic. Add a touch of fish sauce at this point, then return the chicken parts and add water (or better yet, a light homemade chicken stock with little salt). Adjust fish sauce, season with salt (if necessary) and pepper and let this simmer for 10-15 minutes or so. Taste to ensure it’s just right. Absolutely right that it is restorative. Growing up, whenever under the weather, we have tinola or lugaw. The elders tell us that when sweat starts to break after eating, fever will soon break too. 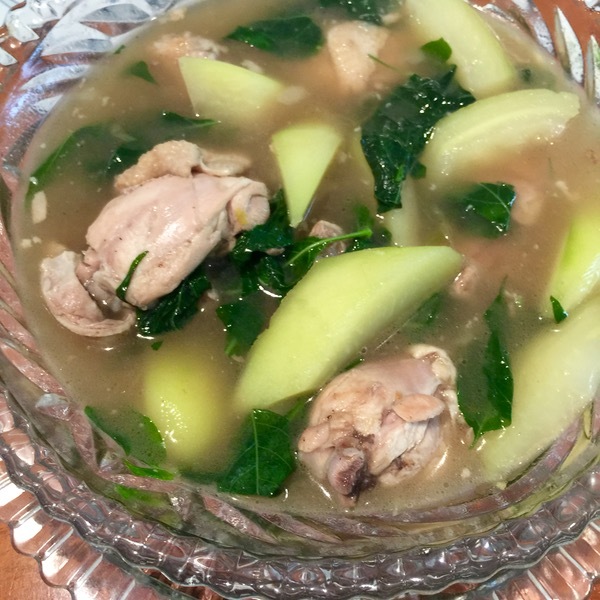 Chicken tinola is comfort food, same with pesang dalag! 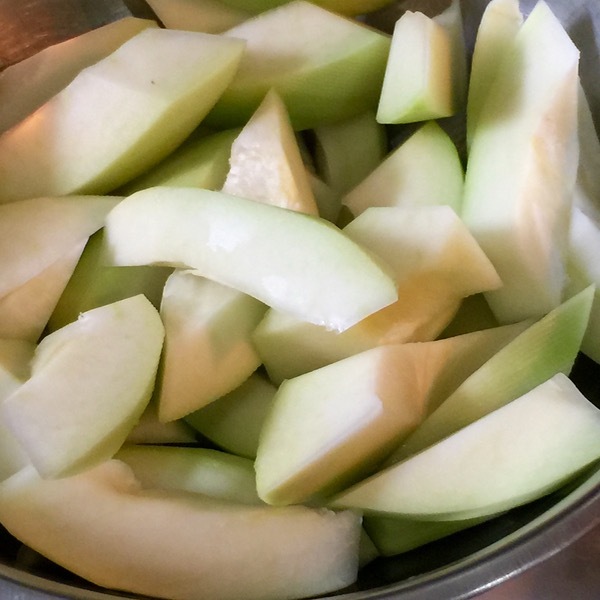 I always use a “manibalang” papaya instead of the unripe ones, picked from my own garden. This gives a hint of sweetness to the broth. I also add malunggay leaves with the sili leaves for more greens. No wonder you got better fast. 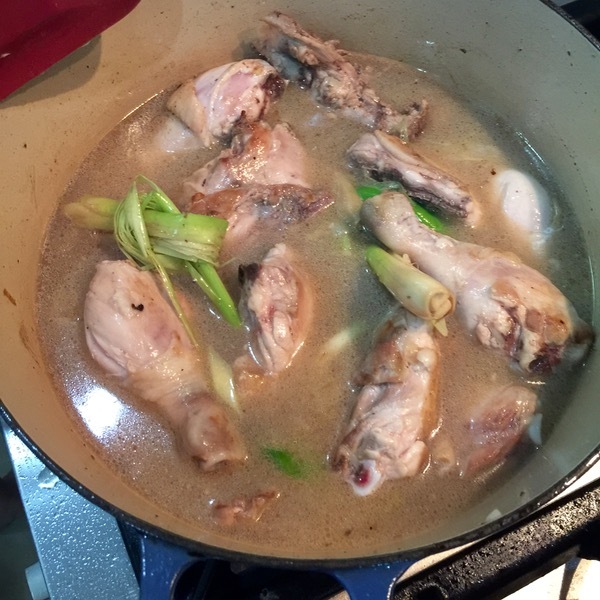 Chicken Tinola came up in Noli right at the opening chapter, not exactly as a restorative but exalted enough as dinner starter at Capitan Tiago’s banquet served to a cross-section of Manila’s power elite of the time. Further on, we get a glimpse of a few other local dishes at a picnic with the young ladies talking about suitable methods of cooking particular types of fish. Then at the tragic closing chapter, a combo that anyone of us would find great for breakfast nowadays, not the wild boar jerky that Pilosopong Tacio gave poor Sisa from time to time but grilled dried tawilis partnered with tomatoes that she readied because it was her sons’ favourite. That portion of Noli where Pedro devoured the food prepared for the children was as heart wrenching but a complete antithesis of Valjean’s final act. Both were fathers, although Valjean just a surrogate, representing the worst and the best in humanity. i don’t eat the meat in tinola, just the broth and vegetables, and for me, the best part about tinola is that the leftovers get to be arroz caldo. when i was young and chickens were bought live in the market and slaughtered at home, my mom made sure to save the chicken’s blood in a saucer. she’d put some uncooked rice over the top, and when the tinola was simmering, dump the now-gelled blood into it. that was a real treat for us kids, in addition to the chicken’s liver, and any unhatched eggs inside the fowl if it was a hen. In the very last chapter of Krakatoa, the author visited the new island that emerged at the site of the old disappeared volcano to put a fine finis to his book. The newborn island had been quickly colonized by flora and fauna from the neighbouring islands which afforded him a scary encounter with a six foot monitor lizard, also called bayawak in Indonesian. Reminded me of a classmate in high school with that exact family moniker who was constantly taunted by my other classmates with “dahong sili.” Boys can be subtle, cruel and creative all at the same time. @Footloose, talking about monitor lizard, I was in Palawan a couple of months ago with family. And we were at the underground river and I saw signs not to feed the monitor lizards. I guess these are indigenous to the Philippines too. Scary! I know when I was in Badian, last year, a friend saw one great big lizard. Not sure if it’s from the same family. 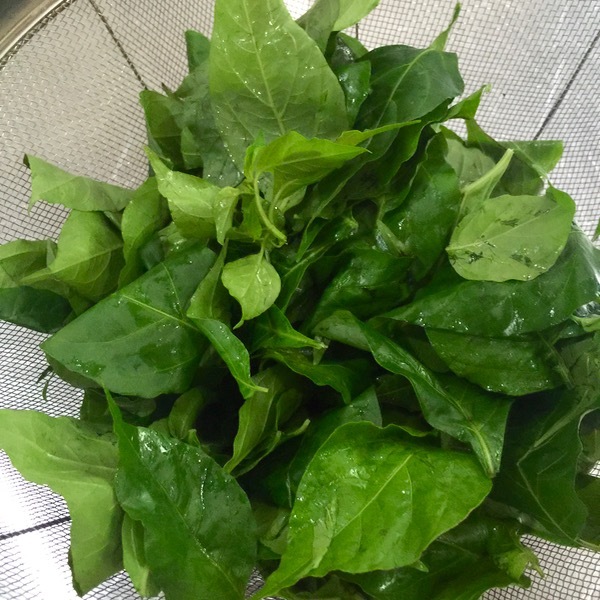 Aside from Chili leaves, what green goes well for Tinola? Our family always crave for Filipino dishes even though we’ve been residing in Toronto for years now. i substitute moringa (malunggay) leaves or spinach if chili leaves is not available in the market. Those leaves are nutritious too.